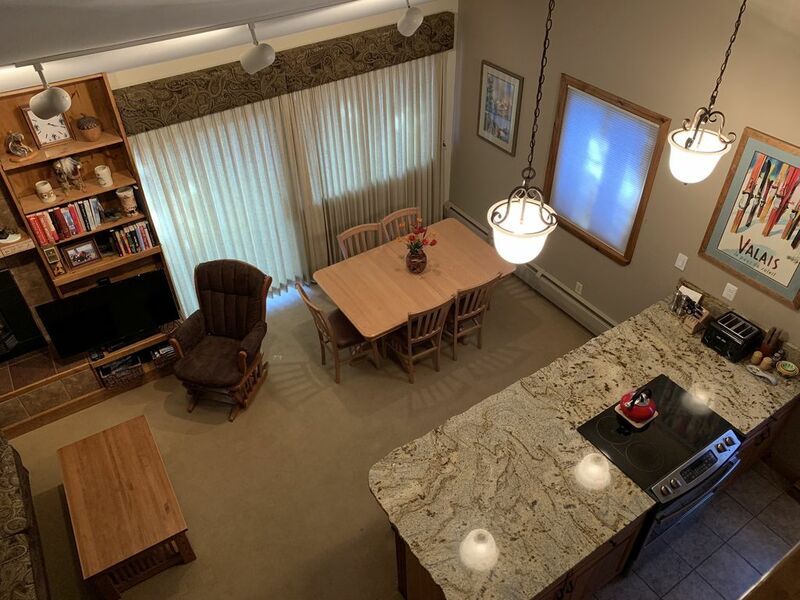 Welcome to our Timbernest Condo and its convenient location to the ski area and town. The unit is a third (top) floor walk-up, bright corner unit located on the mountain side of the complex. You will appreciate the warm atmosphere of the unit. The condo is one of the best options available for combining mountain and town access at a reasonable price. We are conveniently located on the first street to the south (just 200 yards distance) of the Peak 9 hi-speed Quicksilver lift. The street is residential with local traffic only. It is an easy 5 minute walk to the lift, Maggie Lodge, adult and children ski schools, a skier's day nursery, and town Main Street. So park your car and enjoy Breckenridge for a fraction of the price of the Marriott and Hyatt properties located on the same block. Historic Main Street, ice skating, the best restaurants in town are all within walking distance. Four large hot tubs and outdoor heated pool are available for your use. The unit also contains a whirlpool bath that feels like a million dollars after a hard day of skiing, climbing, or just shopping. This cozy, reasonably priced condo is ideal for one or two families or three couples. We have extensively refurbished the unit for our family to enjoy with new bathrooms, woodwork, furniture, beds, flat screen TV, wireless internet, CD and DVD player, dishes,etc. The unit is fully furnished and equiped for you to have an enjoyable stay. We are happy to share 'our place' with you when we cannot be there. ++ Main floor bedroom with one queen bed. ++ Upstairs family suite with one queen in the bedroom and the loft with TV and DVD/VCR, a bunk bed setup with lower double bed, and upper single bunk, plus single trundel. Great for two adult couples or family with up to four children. Enjoy historic Breckenridge and the most popular ski complex in Colorado right at your front door in the winter. Escape the heat of the plains and lowlands in the summer to enjoy hiking, mountain biking, white water rafting, hot air ballooning, kayaking, horseback riding, jeep tours of gold rush ghost towns, camping, the alpine slide, and above all, sunshine, blue skies, and the cool nights at 9600 feet. Brochure available by e-mail or U.S. Mail on request. The Counts family has been skiing in Breckenridge for three generations. We first visited in 1973 when there was only two paved streets - Main Street and Ski Hill Road. There were no stop lights in Summit County and Peak 9 had just opened so you could ski directly to town. We have watched the ski area, town and county grow as our family has grown. Yes it has changed, but so have we, and the excitement of arriving in the mountains, a new snow fall, or a bright, crisp summer day is just as invigorating as the first day we set foot in town. We are pleased to share our mountain home with you when we cannot be there. Where else can you wake in the morning; look out the window to see what it is doing on the mountain; grab the skis and head to the slopes; or opt for a stroll in town, a hike, a game of golf, or just a pleasant lunch or evening with family or friends in one of the many restaurants in town. Enjoy life! Enjoy your visit to our family's favorite town in all of the USA! The condo is one of the best options available for combining mountain and town access at a reasonable price. We are conveniently located on the first street to the south (just 200 yards distance) of the Peak 9 hi-speed Quicksilver lift. So park your car and enjoy Breckenridge for a fraction of the price of the Marriott and Hyatt properties located on the same block. Downtown Breckenridge featuring shopping and great restaurants is a short 5 minute walk. This is a 3rd floor corner unit located on the mountain side of the complex. Two decks available from the living area and master bedroom. Guests have privileges in the Columbine Association pool. Free laundry facilities on premise. Ice Skating, Horseback and Sleigh Riding, Breckenridge is a year round resort with full amenities!! !